Another day, another mind-bending celestial discovery. It was only yesterday that we told you about Philip Gregory's claim that there are three planets sitting inside Gliese 667C's habitable zone (his paper is still under review and is yet to be published). And now, Hugh Jones of the University of Hertfordshire and his colleagues have announced the discovery of five planets orbiting around Tau Ceti, a star that's just 12 light-years away — and one that very closely resembles our own sun. Tau Ceti is definitely an interesting star system — and now even more so. It's located in the constellation Cetus and can be seen with the naked eye. And in fact, its sun-like characteristics have made it a SETI candidate for decades. According to the study, the five planets are between two and six times the Earth's mass, with orbits ranging from 14 to 640 days. One planet, HD 10700e, is four times the mass of Earth and sits at about 0.5 AU (Earth-distances) from its parent star — which, given Tau Ceti's low luminosity, places it directly inside the habitable zone. Another planet, HD 10700f, resides slightly closer to Tau Ceti than Mars does to our Sun, and it takes 640 days to make a complete orbit. Tau Ceti is quite similar to our own sun, although it has only 78% of its mass and 55% of its luminosity — which implies a habitable zone more proximate to the star. And in fact, a planet would have to be about 0.7 AU to match Earth's exact Goldilocks spot (at 0.5 AU, HD 10700f is pretty close). Moreover, Tau Ceti has a substantial debris disk. It has more than ten times the amount of cometary and asteroidal material orbiting around it than our sun. From an astrobiological perspective, this is not good news, as its planets are likely subject to frequent bombardments. Tau Ceti also features low metallicity, making it difficult for terrestrial (rocky) planets like Earth to form. So, Tau Ceti is not a fantastic candidate for habitability, but an intriguing one nonetheless. Jones made the discovery by analyzing the subtle changes made to Tau Ceti's light emissions as the planets orbit around it. Every planet that sits within Tau Ceti's gravity well has an effect on its stability — kind of like a tug of war in which a planet doesn't stand a chance of winning, but has an impact nonetheless. These wobbles result in minute changes to the star's light, which can be measured in varying spectral shifts. Measuring these "radial velocities" is not easy, as other factors often come into play. The trick is to parse the noise from the true signal. To that end, Jones and his team utilized a new "noise modelling" technique to remove the superflous information, what allowed them to see the relevant signals hiding in the data. The team pulled this data from three previous planet-hunting efforts, namely Harps, AAPS, and HiRes. However, [Mikko] Tuomi's team warns that disturbances on the star itself, rather than orbiting planets, may be producing the small velocity changes in Tau Ceti. "They're really digging deep into the noise here," says Sara Seager, an astronomer at the Massachusetts Institute of Technology in Cambridge who was not part of the team. "The [astronomical] community is going to find it hard to accept planet discoveries from signals so deeply embedded in noise." "They're pushing the envelope," says Gregory Laughlin, an astronomer at the University of California, Santa Cruz. 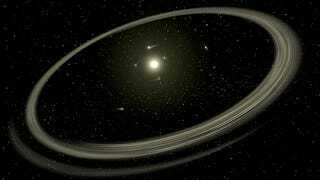 "Some or even many of these planets could go away. But I think that they've done absolutely the best job that you can do, given the data." Laughlin says it's frustrating that the most interesting planets-small ones like Earth-are so challenging to detect: "You have to get tons and tons and tons of velocity measurements over many years, and then you really, really have to take extreme care-as this Tuomi et al. paper does-to get rid of all the systematic noise." Team member Chris Tinney, an astronomer at the University of New South Wales in Sydney, Australia, acknowledges the problem. "It's certainly very tantalizing evidence for potentially a very exciting planetary system," Tinney says, but he adds that verifying the discovery may take 10 years, and the scientists didn't want to wait that long. "We felt that the best thing to do was to put the result out there and see if somebody can either independently confirm it or shoot it down." These concerns aside, the paper has been approved for publication in Astronomy and Astrophysics. You can read it here.